For a full listing of the tools, attend the Tuesday night New Associate Training Call. See the call schedule on the "Important Numbers" tab for all the information for all calls. The PowerSuite tools packages were put together based on many years of experience from numerous Coastal Directors. The value of these Tools is phenomenal. The fact that successful Directors have mapped out a solid system of building a Coastal Business and then made it available to everyone in Coastal is an exciting benefit to being a part of Coastal. We encourage caution when it comes to choosing to build your own web site or purchasing a web site that another Director or Group has created. The choice to do so has often meant numerous headaches and problems for Coastal Representatives. Provides you the ability to introduce the Coastal opportunity and Product through an automated follow up system. 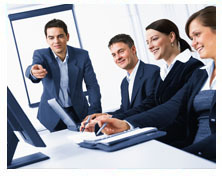 Assists you in training New Associates and allows them to plug into the same duplicated system. Personalized Contact Info on each website; Freedom to change all personal information as well as the Username of your website. Upload a Personal Picture, Track Statistics and Customize Content on various pages. Resource Center: Back Office full of Training and Support, be sure to review this area in great detail. Printable Profile: Available on the Retail Site, Business Incentives Site and the Business Opportunity Site, the printable Profile allows a prospect to take a Printed Description with them. Your Personal Info appears on the Profile. Online Contact Manager: Track and manage your entire business from any computer. View your hottest prospects activities at-a-glance. Follow-up tasks and to-dos are always right at your fingertips! Presentation Sites: Professionally designed presentation sites to provide important details about your product and opportunity. Website Rotator Co-op: Create a Rotator Co-op to share the cost of advertising with other people on your Team! Online Appointment Calendar: Never miss a follow-up, meeting, or anything! Group events are automatically added by your team's administrator too! Video Manager and Video E-mail: Embed cool videos right into your e-mail making them magnetic and impossible to resist. Live Chat: Actually "see" the visitors who croon your site and communicate with them in real-time! 2. Professional Presentations Pre-Loaded: You TeleCenter system will come ready to go with a Main Greeting and several extensions already professionally recorded for you. The Audio Information Center has messages about the Coastal Product, Getting Started, Testimonials and more already loaded to the system. You are encouraged to record an extension of your own with your story and perhaps even re-record the Main Greeting in your own voice if you wish. Either way the system is sure to help you close sales. It will be automatically updated for you whenever the leaders of Coastal record newer material or at any time you may override these greetings and record your own material. 3. Ad-Tracker: Allows you to place various 3 digit codes in all of your advertising pieces, caller is prompted to enter that number when calling. Message taken displays the 3 digit code they entered. Allows for detailed tracking of Ad Responses. You know EXACTLY which ad they are responding to. 4. Message Notification: At no additional charge the system provides instant notification of all messages. Via Phone, Pager or E-mail. E-mail Notification allows for the Playing, Saving and Deleting of messages from within your e-mail Inbox. 5. Fax-On-Demand: A Document may be loaded to an Extension for Fax-on-demand purposes. The caller will be prompted to enter the Fax number they want to receive the document on and then the system will dial that number and send it. (outbound dial to send Fax is a billable per minute fee) This option is great when traveling to send the ‘Printable Profile’ or the Package ‘Order Form’ to a prospect. 7. Co-Op Rotational number: A TeleCenter number that would be used by a group to advertise in a large Print media. All TeleCenter numbers that are programmed into the Rotational will receive their turn to get a greeting left on the main system. Only Greetings are Rotated, not Hang ups. Message is left in your personal TeleCenter mailbox. 8. Broadcast: This is how you stay current on what is happening with Coastal. Occasional Broadcast Messages and Training are sent out via Broadcast from the Board of Directors to all TeleCenter Subscribers. Each TeleCenter Subscriber may also manually create his/her own Broadcast list. 9. Phone Match: Shows the Name and Physical Address of each Caller to your system if they are listed in the Phone Book. Phone number is always displayed. Get the entire system today (everything above included) and put it to work for you for just $69.95 per month. With just 3 active referrals your $69.95 fee is waived!